Your feed in Leadfeeder is most likely full of great B2B leads. Every now and then you might, however, come across leads that are irrelevant, have a strange name or companies that are in fact ISPs. You should consider using the report feature for those leads. Leadfeeders Hide feature will enable you to hide the lead or/and report it to us. STEP 1: Open the lead and click Hide. STEP 2: Select if you want to hide the lead or not. 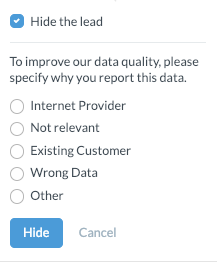 Then choose whether you want to report it to our data quality team. If you decide to report the lead, do it by selecting a reason and clicking then Report. Our team will take care of your request and investigate the lead details.